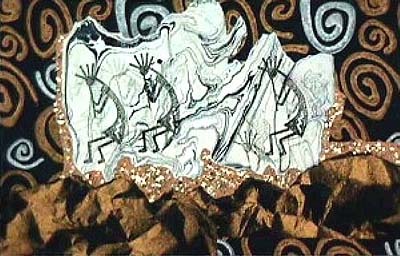 Southwestern images are intriguing, especially the impish Kokopelli, dancing as he plays his flute. Here he reminds me of a ghostly guardian of the veins of gold in a primitive cave. I arranged decorative papers on illustration board, adhering them with Golden Soft Gel. The marbled paper in the background is my own handmade paper, which required heavy gel to attach it to the board. When the papers were dry, I used rubber-stamp Kokopellis for the focal point, then added clumps of mica flakes to suggest gold nuggets in veins around the cave. For more on collage techniques, please see my book Creative Collage Techniques.